The aim is to bend the wire in a roughly heart shaped design so that the top just touches the + end of the battery and the bottom curls around the base (i.e. 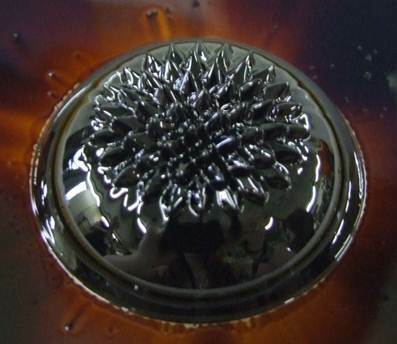 magnet). It needs to be close enough so that a current will flow but not so close that friction stops it from moving. When a current flows through the wire a force is exerted on it due to the magnetic field of the magnet at the bottom of the battery. (The direction of this can be determined using Fleming’s left hand rule.) This produces a torque on the wire that results in it rotating about the battery: in the example above the wire would rotate clockwise. 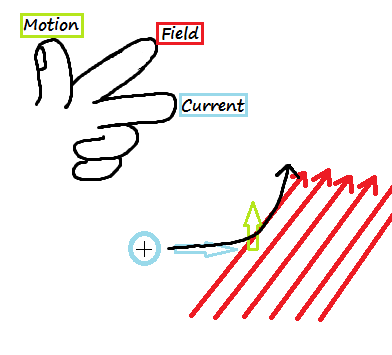 This entry was posted in Magnetism and tagged battery, fleming's left hand rule, force, homopolar motor, magnet, motor on July 14, 2014 by kmorrison2013.